3 Reasons Your Facility Should Consider Mat Rental | Ace Uniform Services, Inc.
Mat rental can benefit companies in many ways! Managers of facilities know just how important the perceptions of their clients are to their business. First impressions are everything in business and companies work very hard to present the right image, from outfitting front-facing employees with professional uniforms to treating the client with respect and keeping your facility clean. If you haven’t implemented a mat rental service yet, you should strongly consider it. Mat rental services can be a great asset for companies for a number of reasons. Here are three big ones. Slip and fall accidents can cost a company a significant amount of money. In fact, it is estimated that more than $70 billion is spent by companies every year on these accidents! So it is important to take steps to prevent falls in the first place. Anti-slip mats can help prevent slip and fall accidents and are perfect for slippery surfaces such as hardwood, laminate, and tile floors. Not only can you protect your employees, but you can also use anti-slip entry mats to protect your customers and clients as well. 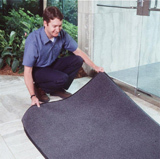 Speaking of entry mats, did you know that a mat at the entrance of your building can reduce the amount of dust and dirt that enters by more than 80%? A small investment on entry mat rental service can pay off big time in reduced cleaning costs, giving you more time and money to focus on the needs of your customers and clients. Combined with custom logoed uniforms, mats can play an important role in your branding efforts. Your custom logoed mats and uniforms can help instill a sense of trust and credibility with your guests, clients, and customers. In addition, they synergize with your other marketing efforts to create a professional, coherent image that should drive sales and increase brand recognition. This entry was posted on Friday, March 10th, 2017	at 11:15 am	. You can follow any responses to this entry through the RSS 2.0	feed. Both comments and pings are currently closed.